Kitchen design: has the kitchen work triangle had its day? When you’re looking at home kitchen design, you’ll soon come across the “kitchen work triangle”. Used for decades as a tool for efficient kitchen design, it aims to link the three main areas used most in a kitchen – the stove, the sink and the refrigerator. Imaginary lines link these three key areas to form a triangle. The idea is that you can easily step from one to another, as each side of the triangle should be no longer than 9 feet (2.7m). Here’s how it might look in practice. Of course, the triangle concept does assume your kitchen has three walls and you can place each item on a separate wall or cabinet run. Not every kitchen has that luxury, and more to the point, that shape might not suit your home or your lifestyle! So, what are the main kitchen design shapes, and does the work triangle idea suit all types? This is the ultimate space-saving kitchen where everything is arranged along one wall – cabinets, appliances, and sink. This design is ideal for studio apartments and condos, maximizing the living space while still offering a kitchen that’s easy to use. A work triangle is not possible in this kitchen. Named after a ship’s galley, these kitchens have two walls or cabinet runs opposite each other, forming a corridor of culinary excellence! Sometimes known as a walk-through kitchen, galley kitchens are space efficient as there are no corners or unusable spaces. You can have a work triangle, as it will involve two points on one side and one on the other. L-shaped kitchens are ideal for making the most of all the corner space and preventing your kitchen from becoming a thoroughfare through to somewhere else! By placing one line of cabinets at right angles to the other, you have everything within easy reach. What’s more, if you don’t need to place the second run of cabinets against a wall, you can access from either side to make the most of every inch of storage space. 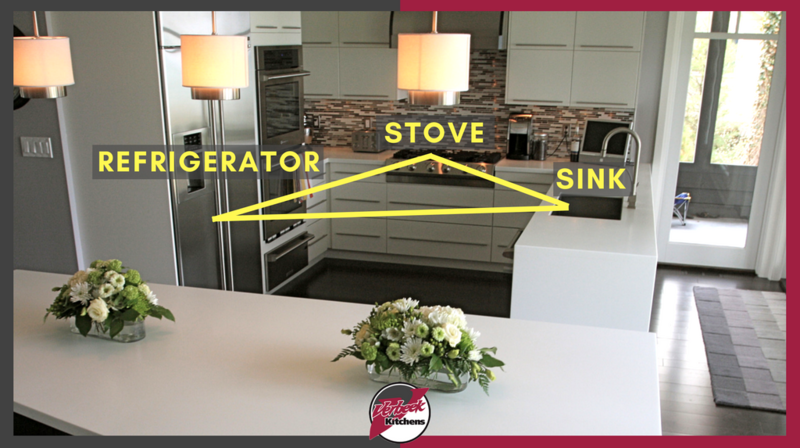 This is the shape the work triangle theory was devised for – three sides of countertops, cabinets and appliances, putting everything within easy reach. However, you don’t actually need three walls to make a three-walled kitchen. The ‘third wall’ could be an island, which allows more flexibility and easier workflow through the kitchen. A work triangle can fit nicely into this design. You can add a kitchen island to almost any kitchen shape, providing you have the space. Islands provide a focal point in the kitchen that people naturally gravitate towards. So, in many homes, the kitchen island is often a countertop with storage underneath, replacing the traditional kitchen table and providing a surface where the family can sit up to eat, work or chat. Islands are perfect for work triangles! For cooks, an island provides a superb opportunity to separate out a major work area they use most. Islands can include stoves, dishwashers, large sinks, have specialist work surfaces such as cool granite, and also include food storage such as wine fridges or warming drawers. Confused by all the choices? Want to design a kitchen for your new home or remodel an existing kitchen? Come in and see us at Verbeek Kitchens!